For this, the last day of the US Fiscal Year, here’s a lovely time lapse video from Tadas Janušonis, a photographer in Lithuania. It’s called "All is Violent, All is Bright", and features a series of interesting optical phenomena in the sky. Did you catch everything? There were noctilucent clouds, halos, moondogs, and a brief lunar corona. But my favorite is the phenomenal oncoming storm starting three minutes in. That, or the giant spider (at 2:40) clearly bent on destroying the world. I’m partial to stuff like that. In May I attended SpaceFest IV, a gathering of space enthusiasts, astronauts (who, I suppose, are legit space enthusiasts), astronomers, and more. It’s a lot of fun, and great to see old friends and meet new science geeks. I missed last year’s, unfortunately, but was happy to be able to go this year again. While I was there I was interviewed about the Mayan apocalypse, Symphony of Science, and building a real Enterprise. It was an eclectic series of questions. There are also video interviews of my friends Dan Durda and Meteorite Man Geoff Notkin, too. I hope there’ll be another SpaceFest next year! I had a lot of fun, and I bet a lot of you reading this would too. – Come to Space Fest IV! My friend Sara Mitchell works at NASA’s Goddard Space Flight Center doing education and public outreach for the space agency. She and her partner, Maggie Masetti, interviewed me a while back for their podcast Blueshift, and the first part is now online. We talked a bit about my history as a skeptic, and why we all need to keep asking, "Why?" There are three more segments to the interview that will go up in the next few weeks, so stay tuned to the Blueshift website and collect ’em all! Yowza. Set it to hi-res and make it full screen. Try not to drool. They have more images, videos, and higher-resolution stuff on the GSFC Multimedia site. You really want to go there and take a look. Our Sun is gorgeous, and dangerous, and amazing. These pictures and videos are more than just beautiful; they are telling us about the mechanisms and processes occurring both on the surface and inside our nearest star. Given the impact this can have on Earth, the more we know, the better. A popular style of do-it-yourself video is what I think of as the "stop-motion whiteboard drawing", where someone films someone else drawing on a whiteboard, explaining some concept or another. It’s surprisingly engaging, and a lot of otherwise complex topics can be better understood this way. This gives you a pretty good overview of how things work, and I’d certainly recommend it for any Astronomy 101 students who want a quick review, or sciencey-type folks who just enjoy learning about the Universe. Which, admit it, is you. There’s just enough info there to make sense of stellar life cycles, and if you want details, well, there’s Google. Or my book. Either way, if you want more fun stuff about star formation, evolution, and eventual demise, you can find it – and this video is a great start. Tip o’ the hydrogen burning shell to Tony Silva via a chain of links starting at Giovanni Picogna. – More M95 supernova news: progenitor found! – Does this cluster make my mass look fat? Mars is weird. Right? I mean, it’s a whole other planet. So you expect it to be weird. Most craters you see are pretty simple: something impacts the ground at high speed, BOOM!, and you get a crater like a dish tossed into soft sand. But this one has two rings, one inside the other. That can happen with huge impacts producing craters hundreds of kilometers across, but this one is small, only 230 meters from side to side – an American football stadium would just fit inside this crater. The most likely explanation for the double ring is that the Martian landscape here is layered. There’s rock and sand on the surface, but underneath that is a layer of ice. The big rim is from the displaced rock, and the inner, smaller ring is from the impactor plowing through the ice. Each layer has a different strength – rock is harder than ice – so it’s as if two craters were formed, one inside the other. Radar observations of Mars from orbit have indicated there’s ice under the surface in this region, so that fits. 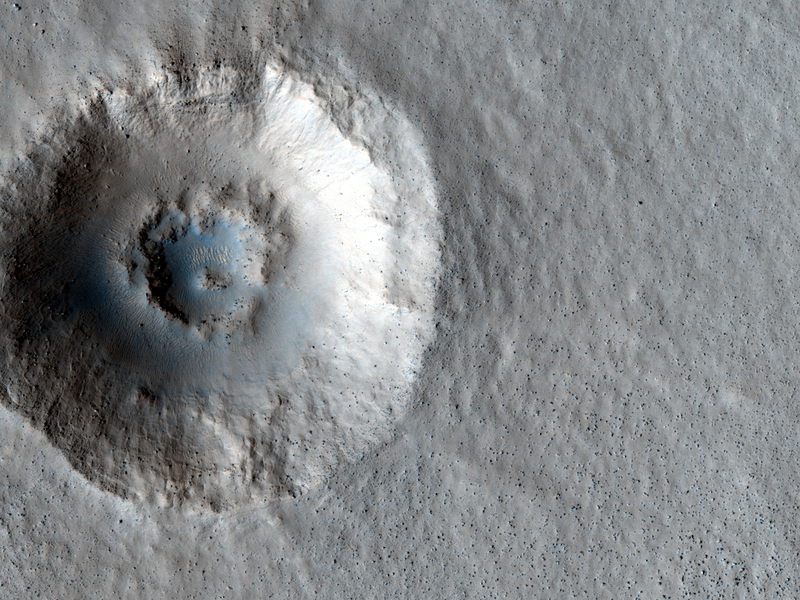 Similar double-ringed craters have been seen on Mars – though the structure and history is by no means well understood! – and some have been found on the Earth’s Moon as well. Those tend to be big, as I mentioned, though they don’t have to be. By the way, the image above is color enhanced to show details. The blue may be from carbon dioxide frost, which can be seen in similar color-enhanced HiRISE images. The ripples in the center are sand dunes, sculpted into parallel waves by the ceaseless Martian wind. Craters this small on Earth are extremely unlikely to form; the impactor would be maybe 20 meters or so across, and objects that size tend to break up when they ram through our thick atmosphere at high speed. Mars has much thinner air, so rocks that size can hit intact. Studying craters on Mars is a chance to see what these hypervelocity impacts are like under very different conditions, which helps us understand them. The physics of extremely high-speed collisions is hard to study experimentally – accelerating large objects to that kind of speed is both difficult and more than slightly dangerous – so it’s nice to have a lab like Mars where we can observe these effects. Tip o’ the lens cap to HiRISE on Twitter. Image credit: NASA/JPL/University of Arizona. Two talks in the Old Dominion! This week sees me returning to the state I grew up in: Virginia. 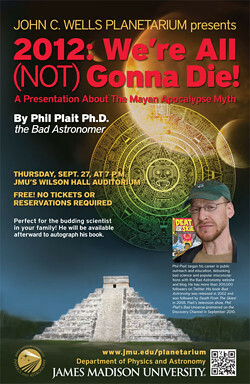 I’ll be at James Madison University Thursday, September 27 to give my "2012: We’re All (not) Gonna Die!" talk – basically destroying the Mayan December 21, 2012 apocalypse nonsense – at 7:00 p.m at the Wilson Hall Auditorium. Admission is free and open to the public. Then, the next day – Friday, September 28 – I’ll be at my alma mater, the University of Virginia, to be the keynote speaker for the 2012 Forum for Interdisciplinary Dialogue called "Fact, Fiction, and Supposition"! I’m honored to be a part of this event sponsored by the Jefferson Scholars Foundation and the Jefferson Graduate Fellows at the University of Virginia. That talk is also open to the public, and will be at 16:00 at The Jefferson Scholars Foundation Hall. They’ve set up a Facebook page for the event if you like that sort of thing. My good friend Dr. Nicole Gugliucci (and UVa alumna) will be speaking the next day there, too! I haven’t been back to central Virginia in a good long time, so it’ll be nice to see it again. I hope the trees are turning now! And I hope to see some of you Wahoos there, too. – MSNBC interview: 2012, the year the Earth doesn’t end. Again. Via Jenny Winder, I saw this video showing footage from underwater nuclear bomb tests in 1958. It’s astonishing. The awesome power and energy released is difficult to wrap your head around. Think on this: a cubic meter of water weighs a ton. Now imagine taking a single cubic meter of water and lifting it, say, 100 meters in the air, accelerating it to several hundred kilometers per hour. Now look again at that plume. How many cubic meters of water were are in it? Even being conservative I’d say it was in the millions, meaning millions of tons of water blasted upward and outward by the force of the explosion. It’s terrifying. And mind you, the test shown was for a relatively small blast: about an 8 or 9 kiloton yield (the equivalent of 8-9 thousand tons of TNT), whereas big nukes are capable of 20 megatons, over a thousand times the explosive yield shown. I’m fascinated by big bangs – from the first one, to supernovae, and all the way down to bombs we humans make in our clever and plodding attempts to kill one another. Every now and again it’s good to get a solid reminder of just what these explosions are capable of. – What the hell were we thinking? – Would you stand under a nuclear blast? * Technically, an Aten asteroid has a semi-major axis less than one Astronomical Unit. Orbits are elliptical, and the semi-major axis is the half-diameter of the orbit along the long axis. Despite this, an Aten can cross the Earth’s orbit if its orbit is elongated (eccentric) enough. – VERY bright and spectacular meteor seen over northern UK! 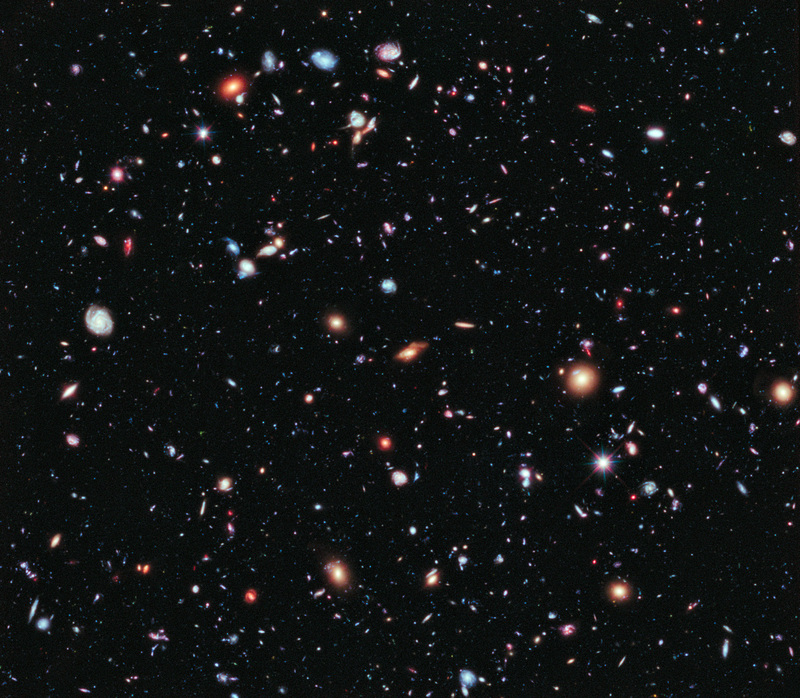 Astronomers using the Hubble Space Telescope have created the deepest multi-color* image of the Universe ever taken: the Hubble Extreme Deep Field, a mind-blowing glimpse into the vast stretches of our cosmos. This image is the combined total of over 2000 separate images, and the total exposure is a whopping two million seconds, or 23 days! 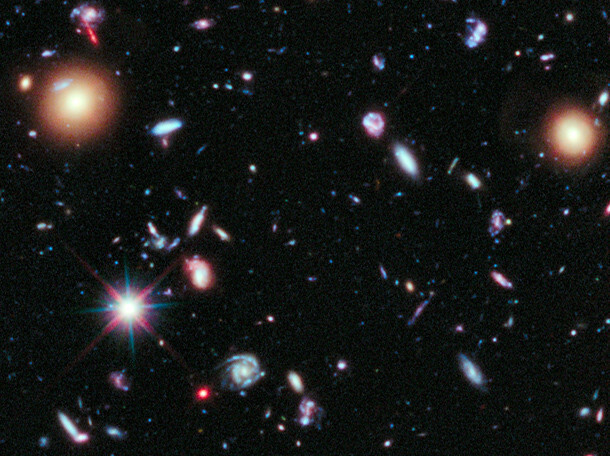 It’s based on the original Hubble Ultra Deep Field, with new observations added in since the originals were done. It shows over 5500 galaxies – nearly everything you see in the picture is a galaxy, an island universe of billions of stars. Only a handful of individual stars in the foreground of our own galaxy can be seen. The variety of galaxies is amazing. Some look like relatively normal spirals and ellipticals, but you can see some that are clearly distorted due to interactions – collisions on a galactic scale! – and others that look like galaxy fragments. These may very well be baby galaxies caught in the act of forming, growing. The most distant objects here are over 13 billion light years away, and we see them when they were only 500 million years old. In case your head is not asplodey from all this, I’ll note that the faintest objects in this picture are at 31st magnitude: the faintest star you can see with your naked eye is ten billion times brighter. I’ll note that the purpose of this and the other deep field images is to look as far away and as far back in time as we can to see what the Universe was like when it was young. The wealth of data and scientific knowledge here cannot be overstated. But I suspect, in the long run, the importance of this and the other pictures will be their impact on the public consciousness. We humans, our planet, our Sun, our galaxy, are so small as to be impossible to describe on this sort of scale, and that’s a good perspective to have. But never forget: we figured this out. Our curiosity led us to build bigger and better telescopes, to design computers and mathematics to analyze the images from those devices, and to better understand the Universe we live in. The folks at Hubble will be holding a public interactive discussion of the HXDF image on Google+ at 13:00 Eastern (US) time on September 27th, where you can ask astronomers questions. Tune in and learn more! * In 1998 a single-color image was taken with the STIS camera on Hubble, and reached similar depth. It would take some serious analysis to know which image sees fainter objects!